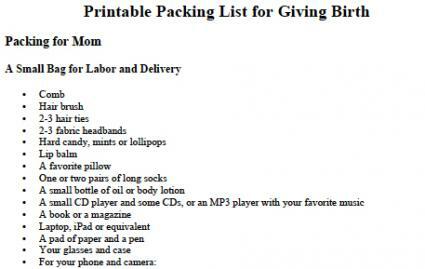 Download a printable labor and delivery packing list. Less is more when it is time to pack for your labor and delivery hospital stay. You will get varying advice and long lists from family, friends, and other sources, but the fewer items you pack, the less you will have to keep track of at the hospital. Pack only the essentials so you will have less to repack to go home after your baby is born. If you need help downloading the printable packing list above, check out these helpful tips. Remember that the hospital will supply you with toiletries, so unless you can't live without your favorite shampoo or shower gel, leave those items at home. Don't wait until labor starts to get packing. At about 24 weeks, start to acquire your essential items so your packing will be complete by 36 weeks. Use zip lock bags to group items together, which will help you to find them easily at the hospital. Consider bringing your laptop, iPad or equivalent to read an e-book or do work during a long labor. If the hospital provides an Internet connection you can easily update your Facebook with photos of your new baby. Pack a going-home outfit for when you are discharged from the hospital. Don't forget that your uterus and belly will still be enlarged. Pack a comfortable outfit to fit about a 5 to 6 month pregnant belly, and is easy to put on and take off. Consider packing the baby's items in large zippered plastic bags (such as a sweater bag or two). Slip these in your own after-delivery suitcase so you have one less bag to carry, or leave the baby's bag at home and plan for someone to bring it in after delivery. A rear-facing car seat is essential. Most hospitals require confirmation of a properly installed car seat before allowing baby to leave for home. Practice installing the car seat in the car well before delivery date. Dad should pack a few essentials of his own. Dad should wear comfortable, unlaced shoes. These will be easier to take off and put on if you want to get comfortable in the room after delivery. A breast pump; the hospital will supply one if you need it during your stay. Plan ahead so you can have your bags packed and ready to go by 36 weeks, or sooner if there is a chance of a preterm birth. Don't scramble at the last minute to try to gather the things you need. Be prepared to grab your bags and go when your labor starts, or if your water breaks early.